In the Micronesian Islands, a top secret, U.S. government– sponsored undersea lab conducting vital biomedical research on a rare jellyfish known as the Blue Medusa suddenly . . . disappears. At the same time, off Bermuda, a bathysphere is attacked by an underwater vehicle and left helpless a half mile below the surface, its passengers—including Zavala—left to die. Only Kurt Austin’s heroic measures save them from a watery grave, but, suspecting a connection, Austin puts the NUMA team on the case. He has no idea what he’s just gotten them all into. A hideous series of medical experiments . . . an extraordinarily ambitious Chinese criminal organization . . . a secret new virus that threatens to set off a worldwide pandemic. Austin and Zavala have been in tight spots before, but this time it’s not just their own skins they’re trying to save—it’s the lives of millions. 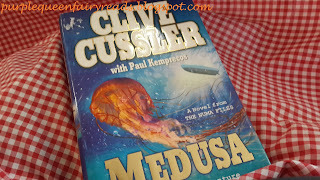 I have been a fan of Clive Cussler since the very first book I read, Atlantis Found, more than 10 years. For a while, I was diving into his titles on quite regular basis but I have stopped for many years already. I guess I was quite tired of Dirk Pitt(R) . I thought of picking it up again with the recent read of Rise the Titanic! but it didn't really appeal to me and Medusa also failed to seduce me even though generally, it's a good thriller. Maybe I have outgrown the adventures of what Clive Cussler has to offer or maybe I have just changed my reading preferences. For fans of Clive Cussler, you will not be disappointed by Medusa. Although it features another of Clive's hero and not Dirk Pitt, Kurt Austin is pretty heroic too. By the way, Dirk is now the Director of NUMA so I guess he's pretty desk bound so it's Kurt now who's getting all the adventure. But I am sure there's a couple of adventures out there which features Dirk still but for me, I won't be jumping off my boat for them anytime soon.